Welcome to ambassador week at Papertrey Ink! 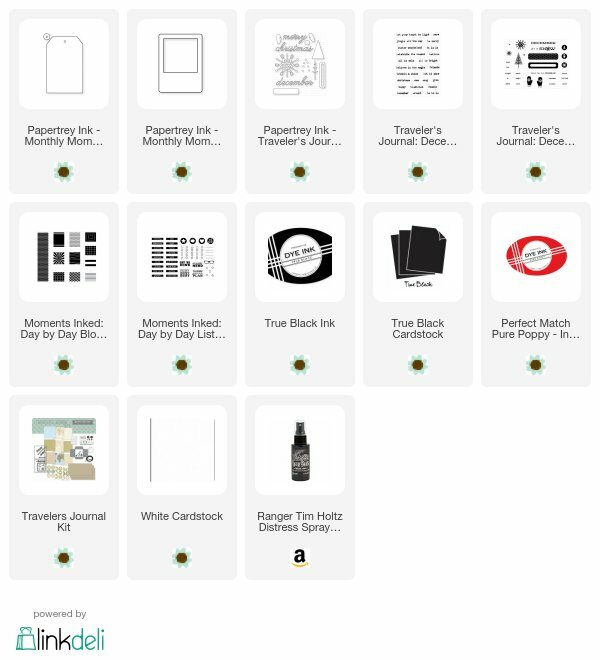 Today is the Travelers Journal focus and we are all about adding Monthly Moments products into our journals! My scheme for this album is kraft, black, and red, with hints of white. I used paint splatter to keep the vibe a little artsy without going too overboard for the look I wanted. These gorgeous die cuts are from the new Travelers Journal: December sets and they are a MUST HAVE for december documenters! The Moments Inked: Day by Day Lists stamp set also helped me create a relaxed album guide. The giant Journal Card 6 die is from the Monthly Moments Collection. For those of you who haven’t looked into the MM collections yet, do yourself a favor and take a peek because they are the perfect complement to the Travelers Journals!! For this layout, I die cut it from kraft cardstock and stamped the “believe in magic” sentiment repeatedly to create a line at the bottom. I finished it off with an oversized white protection ring and black and white twine.